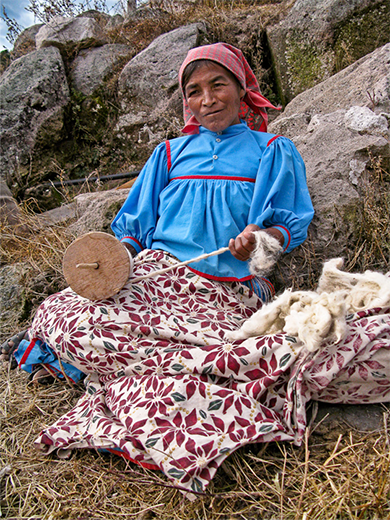 These images document the work of a traditional Tarahumara blanket weaver. Blanket weaving is in rapid decline among the Tarahumara due to the introduction of cheaper, imported blankets from China so it was urgent to record this fast-fading art. Beginning with the hand shearing of the sheep using common kitchen scissors, the video follows a Tarahumara woman through all the steps and processes of creating a hand-woven blanket, ending with her working at a giant loom. I wanted to not only document the processes but also to instill in the viewer an appreciation for the art and craft of weaving. Mexico’s Tarahumara are one of three indigenous groups still maintaining their traditional lifestyle by living in remote areas of the Copper Canyon, in the state of Chihuahua. They are designated a National Treasure of Mexico. I am available to speak and show the video “Tarahumara Blanket Weavers” as well as to display still photos and the blanket itself. The lecture details my personal experiences with the weaver, Maria Elena, and my own, necessary use of the massive blankets while traveling and camping in the back country of the Sierra Tarahumara.